1. Firstly, remove the glass from your chosen photo frame. Take a sheet of Belle and Boo paper and have it on the table facing down. Place your frame facing down on top of your sheet. You’ll be using your frame as a border, so first use a pencil to draw around the window inside your frame. Then draw around the edge of your frame. Cut out your window and your frame shape. 2. Glue your paper to the front of your frame. Measure the length of the frame and use this measurement to cut a piece of Belle and Boo ribbon. Adhere this to the left of your photo frame. 3. 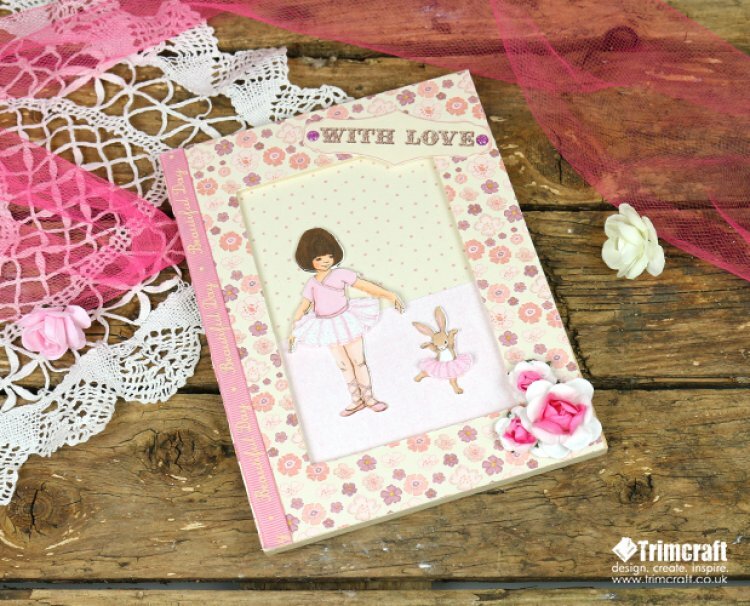 From the Belle and Boo decoupage pad, take the ‘With love’ sentiment and stick this to the top right corner of your frame. Add a Belle and Boo purple glitter dot either side of the sentiment. 4. Use Dovecraft ultimate glue to add a few paper flowers to the bottom right of your photo frame. 5. To make the image inside your frame, take a coordinating sheet of Belle and Boo paper, turn it upside down and draw a rough line around your frame and then cut out. 6. Turn it over so the design is facing you. Using the frame measurements, half the length and cut out a sheet of pink Belle and Boo paper. Layer this to the bottom half of your first sheet to make the floor. 7. Make the Belle and Boo ballerina scene from the Decoupage pad leaving out the first layer. Use 3D foam squares to add depth to your design. Once complete, use double sided tape and adhere it half way up on your pink sheet. 8. Add your finished scene to your frame and now it’s ready to display! The Belle and Boo collection is great for embellishing a range of projects and we just can’t get enough of this adorable decoupage scene, what scene will you pick for your frame? We look forward to seeing your own versions in the project gallery and remember to #Trimcraft when uploading on social media!